You are here: Home » MEDIA » Books » The Thing Itself by Adam Roberts (book review). 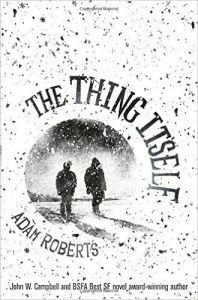 The Thing Itself by Adam Roberts (book review). The thing about ‘The Thing Itself’ is that it’s difficult to say what the Thing is, which is actually the whole point of the thing itself. It can’t be described or even comprehended, due to the way our minds work. I’m afraid that sentence won’t make much sense unless you’ve read the book. I have absolutely no knowledge of philosophy but the way that various characters explore and explain the philosophy of Immanuel Kant and how it explains the way we see the workings of our universe and how that explains the bizarre goings on in this book is very elegant. I don’t know if any of it makes any sense in philosophical terms but I’m happy that the characters in the book understood it and that the consequences in terms of science-fictional possibilities are rather fantastic. Time travel, teleportation, telekinesis and numerous other extraordinary results are postulated but, in each case where any of these abilities prove to be actually possible, there are a whole set of interesting laws and consequences governing them. This puts the whole story into a much more realistic frame than might otherwise be the result. The central character, Charles Gardner, is an everyday kind of guy living in the real world with a not-great life. As things start to get weird, everything that happens is grounded in his mundane life. There’s never a feeling that we’re suddenly in a super-hero or super-villain story or in a cyberpunk or space opera novel. Everything fits neatly into Charles’ everyday world of Bracknell, bin men and the M4. Interspersed among the chapters of Charles’ narrative are diverse accounts of people from several different historical and future periods. In each case, their lives are affected by the thing itself or maybe by The Institute that is delving into the mysteries of the thing. These are written in a variety of unorthodox styles, the kind of thing I like to experiment with in some of my short stories. Fortunately, Adam Roberts has opted to keep these sections in the minority because, although intriguing, some of them are quite hard to read smoothly due to their innovative lack of punctuation or the use of the historical spelling and grammar of an uneducated youth, for example. By themselves, each of these sections is seemingly unrelated, but the challenge is to see how they fit into the consequences revealed during the Charles Gardner sections and how they advance the plot or demonstrate the explanations he gradually comes to understand. I found myself wondering about some of the secondary characters whose lives were visited briefly in the novel. They were very atmospheric and detailed episodes and I hoped to go back to some of them to see what developed, but each only had a single act in which to impart their contribution to the whole. At the end of the novel, it was an interesting exercise to think back and fit their experiences into the later explanations. It’s an enjoyable read, challenging if you want to really delve into the philosophy, convincingly complex if you don’t. Charles Gardner is a sympathetic character and provides a good grounding for the inexplicable goings-on to revolve around. It’s another finely constructed novel from Adam Roberts and an enjoyable and thought-provoking read. Sibilant Fricative by Adam Roberts (book review). By Light Alone by Adam Roberts (book review). Jack Glass by Adam Roberts	(book review). « Sky Pirates (The Chronicles Of Light And Shadow book three) by Liesel Schwarz (book review).